Friday Freebies are back at Price Chopper! 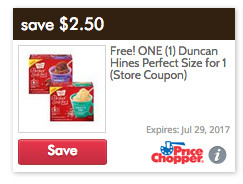 Score a FREE Duncan Hines Perfect Size For 1 w/ store ecoupon. Friday Freebie ecoupons are available to clip on Fridays only, this one can be redeemed thru 7/29. I've been waiting to try these, thank you!